Here’s the latest entry in my Edmonton Etcetera series, in which I share some thoughts on a few topical items in one post. Back in June 2009, Edmonton hosted the ICLEI World Congress to discuss environmental sustainability. I enjoyed attending some of the sessions and related events, in particular the free talk with author Peter Newman on Resilient Cities and Edmonton’s 4th Pecha Kucha Night. Last week, Edmonton hosted the Cities & Climate Change Science Conference. I was only able to attend one community session: While Nations Plan, Cities Act with David Miller, C40 Cities Climate Leadership Group and former mayor of Toronto, and Mayor Don Iveson. When asked about the significance of hosting the event, Mayor Iveson drew a straight line from ICLEI in 2009 to this event nearly nine years later. He told the crowd that hosting ICLEI opened up the discussion and that eventually led to the adoption of the Energy Transition Strategy and made it possible for us to host this conference. He did note though, that “we are not where we need to be on implementation” of that strategy. I remember a lot of discussion about public transit back at the ICLEI event in 2009 and I suspect it was heavily discussed this time too. Mayor Iveson noted that Canada was the last G8 country without a national transit strategy and attributed the fact that we now have progress to the “increased civic literacy” that former municipal politicians like Amarjeet Sohi have brought to the federal government. Here in Edmonton, the mayor noted that our LRT network won’t be built out until 2030, which could open the door for more business-as-usual in the meantime, which is a good argument for an accelerated investment. You probably know that Gondola Over the North Saskatchewan was selected as the winning idea in the Edmonton Project. The couple behind the idea envision “an eight-car system that would stretch three kilometres across three stations, connecting Old Strathcona to the old Epcor power plant and then on to downtown.” It would run year-round and could cost anywhere from $30 million to $300 million. Maybe you think that’s a cool idea, maybe you don’t. It doesn’t really matter, because it almost certainly won’t be built. The Edmonton Project website says the idea was selected to “move to the next phase” but it’s not clear what that is. There’s no funding in place, and such an idea is unlikely to get Council approval. Which is why Councillor Tim Cartmell suggesting a gondola could replace LRT to connect Bonnie Doon and the University of Alberta is so frustrating. Even if a gondola ends up being a little cheaper, or can move nearly as many people, that doesn’t mean it’s a better approach. Of course the car crowd will like the idea of something elevated and completely separate, but that doesn’t help with our city’s desired transportation mode shift at all. Participating in a fun community idea competition? Sure, why not, pitch a gondola. Making a serious Council decision about the future of transportation in Edmonton? No. Stop wasting time on fanciful and unrealistic ideas. 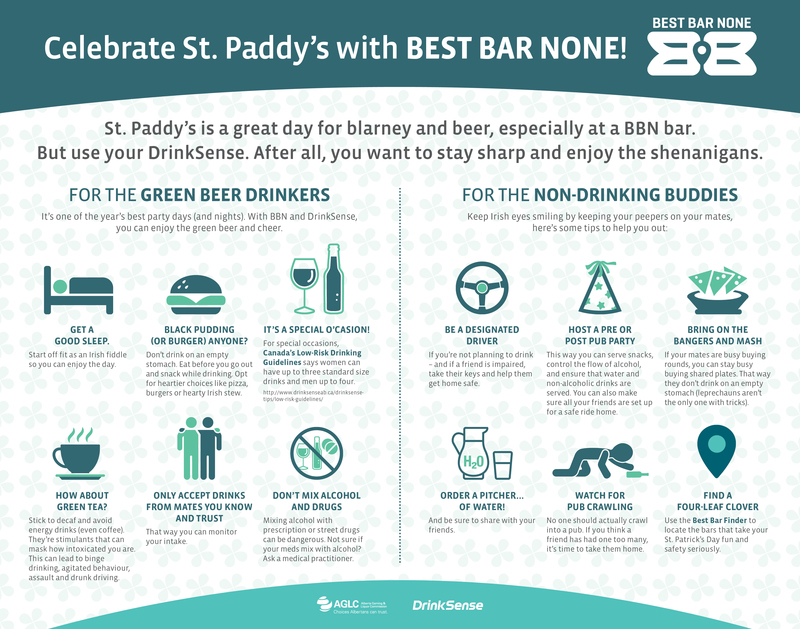 Planning on drinking some green beer on Saturday for St. Patrick’s Day? Maybe consider choosing a bar that has Best Bar None accreditation. “The Best Bar None program originated in the UK in 2006 and launched in Edmonton in 2010,” and there are now more than 150 accredited bars throughout the province. They’ve built a new tool called the Best Bar Finder to located accredited bars near you. I thought their infographic to take advantage of the St. Patrick’s Day connection was amusing. Enjoy safely!